FALL 2018 | NEWSLET TER DEAR FRIENDS OF HISTORY The crisp Fall air beckons at the start of a new academic year in the Department of History. I trust everyone had an enjoyable and productive break. I squeezed in some research time at the British Library in London, presented on my new work on colonial prisons at a conference in New Delhi, and spent a sublime week at a family wedding in the south of France. We are looking forward to another exciting and eventful academic year. Our fall classes already have robust enrollments, the best in years. They do because they have much to off er everyone across campus and in the Access community, ranging as they do from intensive seminars on timely topics to large and small lecture/discussion courses focusing on diff erent world areas, time periods, and themes. We have another banner year ahead of us in public events as well. One highlight will undoubtedly be our annual History Lecture Series (HLS) featuring the Department's faculty members speaking on four consecutive Wednesdays beginning January 9, 2019, on issues of gender and history in diff erent eras and places. The 2018 series, attended by several hundred people from the University and wider community, addressed the topic of "Speaking Truth to Power: Protest and Dissent in Modern History." For specifi cs about the forthcoming HLS and the many talks and events convened by the Department almost on a weekly basis, please tune into our events calendar: history.washington.edu/calendar. This past June we bid adieu to yet another outstanding cohort of students: 118 graduated with a bachelor's degree, fi ve a master's, and another fi ve a doctoral degree. In all, over the course of the 2017-2018 academic year, we taught 4,100 students in our 158 classes. A warm welcome to two new staff members: Alexandra Colley who will be taking over as Assistant to the Chair and Shannon Vacek who will be stepping in as our Undergraduate Advisor. We wish all the best to Star Murray who has moved on to Atmospheric Sciences and Nell Gross who is now with the Geography Department. Finally, a headline from a recent U.S. News and World Report story perhaps worth repeating: its 2017 ranking of the best graduate programs in History rated our Department number twenty-three in the U.S. The rankings placed Ivy League universities in the top four spots; only nine public universities were assessed ahead of us. Our Asian History graduate program ranked in the top ten nationwide. We are also gratifi ed that we are one of the premier History programs in the country because we are dedicated to and excel in undergraduate education as well. HOPE TO SEE YOU ALL IN SMITH HALL AND AROUND CAMPUS THIS QUARTER. 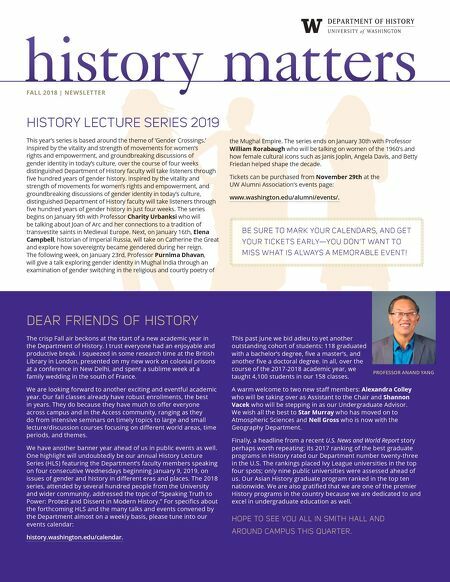 PROFESSOR ANAND YANG history matters history matters history matters history matters history matters history matters history matters history matters history matters history matters history matters FALL 2018 | NEWSLET TER history matters FALL 2018 | NEWSLET TER history matters FALL 2018 | NEWSLET TER history matters FALL 2018 | NEWSLET TER HISTORY LECTURE SERIES 2019 This year's series is based around the theme of 'Gender Crossings.' Inspired by the vitality and strength of movements for women's rights and empowerment, and groundbreaking discussions of gender identity in today's culture, over the course of four weeks distinguished Department of History faculty will take listeners through fi ve hundred years of gender history. Inspired by the vitality and strength of movements for women's rights and empowerment, and groundbreaking discussions of gender identity in today's culture, distinguished Department of History faculty will take listeners through fi ve hundred years of gender history in just four weeks. The series begins on January 9th with Professor Charity Urbanksi who will be talking about Joan of Arc and her connections to a tradition of transvestite saints in Medieval Europe. Next, on January 16th, Elena Campbell, historian of Imperial Russia, will take on Catherine the Great and explore how sovereignty became gendered during her reign. The following week, on January 23rd, Professor Purnima Dhavan, will give a talk exploring gender identity in Mughal India through an examination of gender switching in the religious and courtly poetry of the Mughal Empire. The series ends on January 30th with Professor William Rorabaugh who will be talking on women of the 1960's and how female cultural icons such as Janis Joplin, Angela Davis, and Betty Friedan helped shape the decade. Tickets can be purchased from November 29th at the UW Alumni Association's events page: www.washington.edu/alumni/events/. BE SURE TO M A RK YOUR C A L ENDA R S, A ND GE T YOUR T ICK E T S E A RLY—YOU DON' T WA N T TO MIS S W H AT IS A LWAYS A MEMOR A BL E E V EN T!